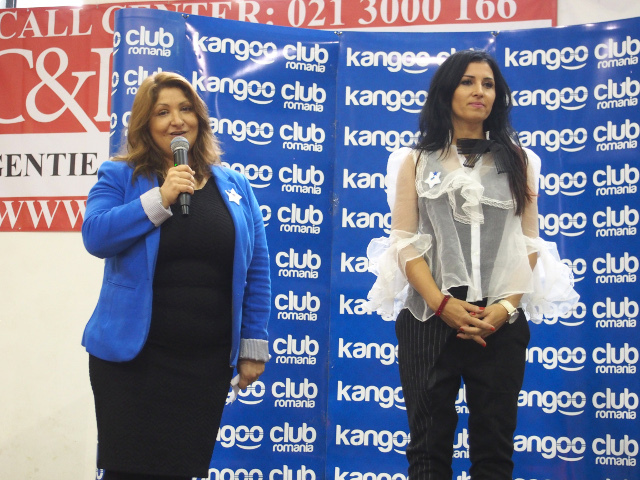 Julie Mayaya, Carmen Negoita, Patricia (Amadeus) and Kinga Sebestyen did Kangoo Jumps to help children with cancer! Julie Mayaya, Carmen Negoita and Patricia Cimpoiasu from Amadeus are the stars who joined the charitable event Kangoo Jumps for Life and did sport with the famous trainer Kinga Sebestyen this year to help children with cancer. Julie Mayaya, Carmen Negoita and Patricia Cimpoiasu, the artist from the Amadeus Troupe joind the charitable event Kangoo Jumps for Life initiated by the fitness trainer Kinga Sebestyen and did sport together with several hundred people, helping children with cancer taken care of by the MAME Association with their donations. The stars arrived at the Apollo Sports Centre at 11 o’clock, prepared for an energizing session of Kangoo Jumps exercises lead by Kinga Sebestyen. 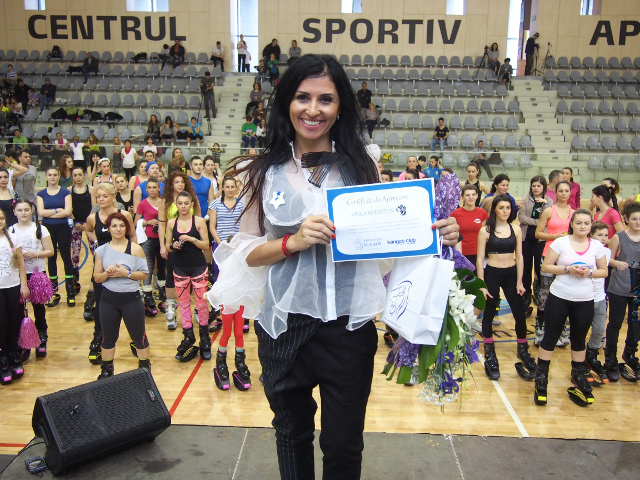 Before the sports program the fitness trainer got a certificate of appreciation from Maria Culescu, president of the MAME Association for getting involved in organizing this charitable event which was presented by Alexandru Constantin and Diana Bart this year, the stars of Prima TV. Afterwards Julie Mayaya, winner of the Romania’s Voice contest, who managed to lose 16 kilograms with Fat Burning, a program designed by Kinga Sebestyen, held a 15-minutes concert singing live with Kangoo Jumps boots on her feet. During the recitals participants followed warmup exercises with the guidance of Kinga. Among the participants were the fashion blogger Carmen Negoita with her two children, Ingrid (14 years old) and Harry (12 years old) and Patricia Cimpoiasu, artist of the Amadeus Troupe. Everyone did aerobic jumping, dressed in sports clothing, followed the moves indicated by Kinga Sebestyen, at all times wearing on their feet the famous boots that became a worldwide phenomenon. All participants contributed, with the participation fee and their donations in addition towards the MAME Association, to the maintenance of the Center of Stars which is meant to offer sick children counseling, support and recovery services. 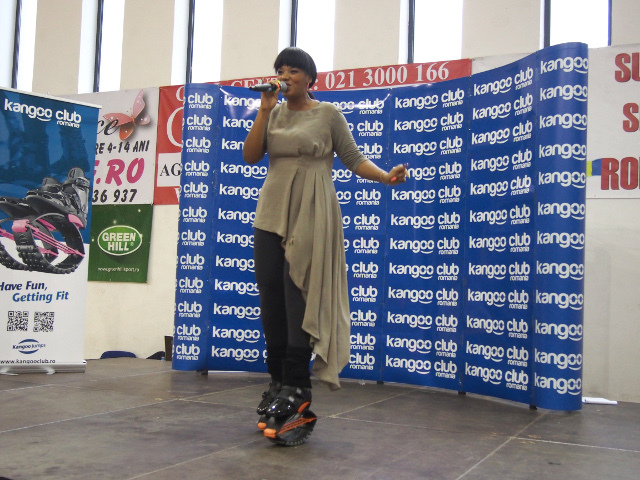 This year Mika Naville joined the event, who owns the Kangoo Jumps Company on a worldwide scale. 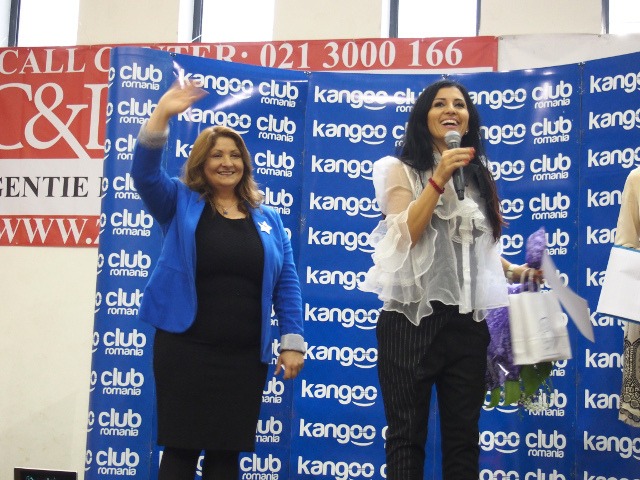 Since 2010 Kinga Sebestyen is getting involved in the “Kangoo Jumps for Life” Campaign. From the debut until present over 35,000 RON were collected thanks to the Kangoo Jumps classes, which were donated for treatments, for improving the playground within the Fundeni Clinic Institution, to sustain a variety of medical investigations for the children in the care of the MAME Association.